Co. Limerick is a place of quiet beauty and rural charm. 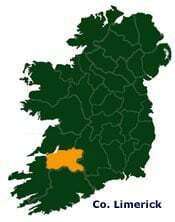 Its gentle undulating landscape is pleasing to the eye from the beautiful Golden Vale in the east of the County to the tidal estuary of the River Shannon. Limerick City has a colorful and fascinating history with castles, ancient walls and museums testament to its past. A particular feature of the County is its range of attractive towns like beautiful Castleconnell by the Shannon or Adare, with its old world thatched cottages and medieval churches.